Welcome to Magnet’s Board of Directors, Laura Doolin! We’re so excited to welcome Laura Doolin as the newest addition to the Magnet Board of Directors. 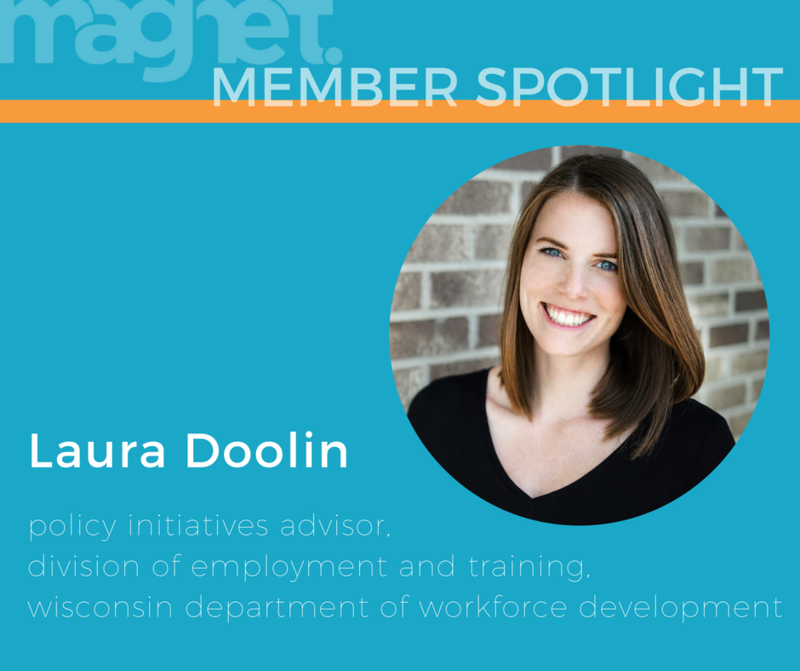 Laura is a Policy Initiatives Advisor with the Wisconsin Department of Workforce Development’s Division of Employment and Training. In that role, she serves as the primary contact for divisional policy recommendations and strives to grow workforce partnerships across the state. In addition to joining Magnet’s Board, Laura is also taking over as chair of our Community Involvement Committee, which coordinates volunteering and community outreach opportunities for Magnet members and friends. If you’d like to get more involved in Magnet’s Community Involvement Committee, fill out this simple form to express your interest, and Laura will be in touch soon. We asked Laura a few questions to get to know her a little bit better, but these responses are only scratching the surface. The next time you see Laura at a Magnet event, be sure to ask about her adopted furry friend, her love for all things cooking, traveling, and eating, and the professional accomplishment she’s proudest of – it’s a good one! Why did you become a Magnet member? After moving to Madison, I was seeking a sense of community and Magnet offered that. Why have you continued to be a member? Young professional engagement is vital to the success of any metropolitan area, so I appreciate the opportunities that Magnet creates to be involved in the Madison culture, community, and professional space. I also see the potential for Magnet to expand its reach in Madison and make a larger impact on the community. What is the greatest challenge you've had to overcome? Changing industries was a challenge. When I moved to Madison, I also moved to a completely new industry. I went from working in the private sector to the public sector and had to quickly adapt to the new vocabulary, workflow, pace, office, etc. There was a huge learning curve. Our Member Spotlight series highlights the accomplishments of the young professionals who make Magnet the thriving organization it is. Fill out this form to be considered as a featured member in an upcoming spotlight post. Older PostNow Accepting Applications for our Board of Directors!